Freshly cut trees, illegally logged, wait on the riverside wait to be transported from the forest to Mahu for sale. / Ann Wang for Mongabay. 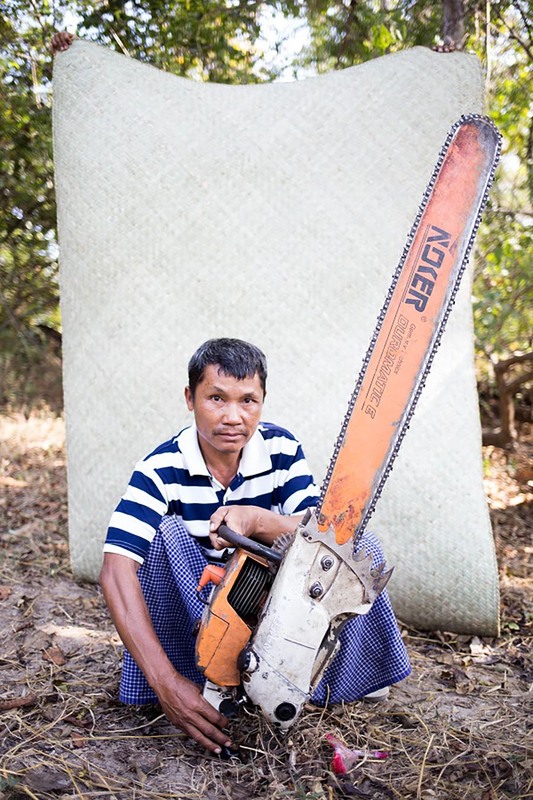 SAGAING, Burma — Pyar Aung still remembers the first time he saw a chainsaw. It was a German-made number being used by one of the logging companies operating in the forest around his remote village in Burma’s northwest Sagaing Division in 2013. “It was so powerful and fast!” recalls 50-year-old Aung, who lives in the tiny village of Mahu. It wasn’t until August 2016 that he got one himself, and today he owns three. Each cost him around US$124, though cheaper versions can be purchased in urban centers for about 7 times less. In spite of the law, he said he was never asked to show paperwork to buy the chainsaws, nor were any of his fellow villagers. The claim is surprising given the fact that logging is practically a cottage industry in his community. Among 37 households they own 70 chainsaws. On a recent visit there, they also said they weren’t aware of the fairly new regulation implemented in 2016 that requires them to register their chainsaws with Burma’s Forestry Department. 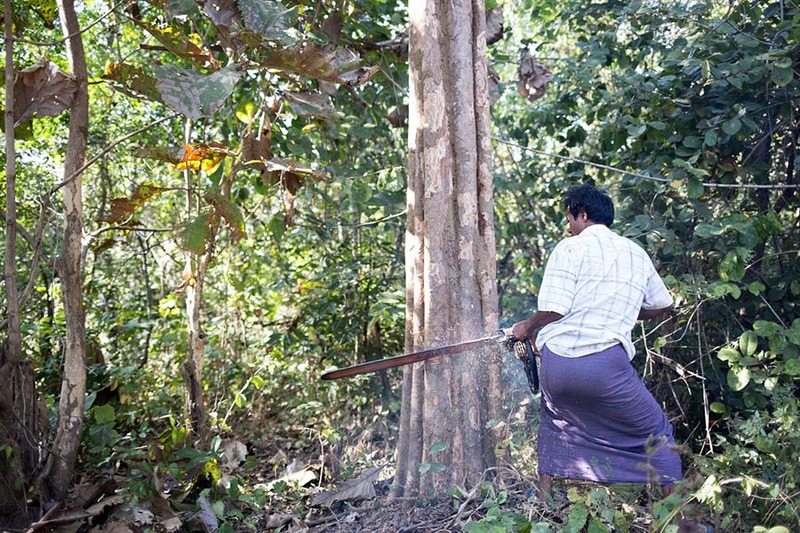 Mahu is a stark case in point of difficulties the Burmese government faces in educating disconnected rural populations about chainsaw ownership and use. The village is an isolated island of homes deep in the Patolon Forest Reserve, part of Alaungdaw Kathapa National Park in Burma’s Sagaing region. An ASEAN Heritage Park, it is Burma’s largest national park, at 1,605 square kilometers (619 square miles). 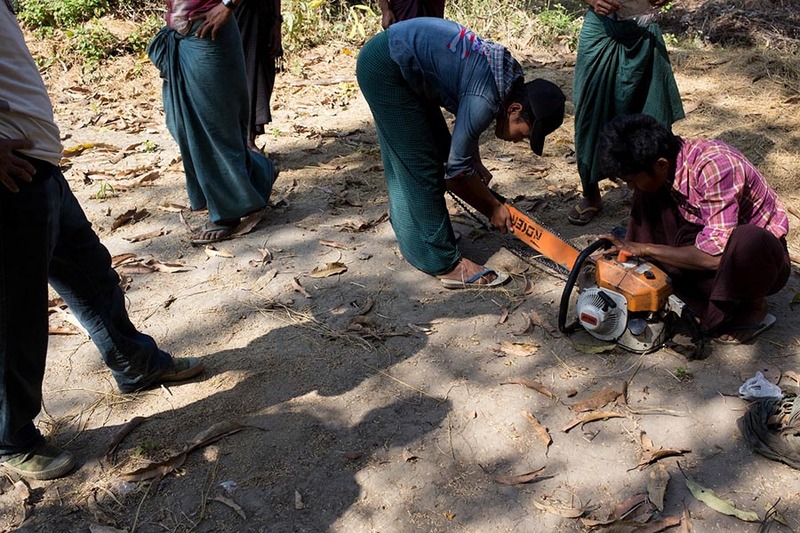 Despite almost non-existent knowledge of safety equipment, training, and protocols, chainsaws are gaining in popularity as the logging tool of choice in Burma’s rich forests. The country is the largest supplier of natural teak (Tectona grandis) in the world. Forestry officials say they began to see an uptick in imported chainsaws between 2013 and 2014. That increase, with numbers that are very difficult to track and verify, is likely in the hundreds to thousands per year. That’s bad news for Burma’s forests. A chainsaw can cut down a tree four times faster than the more traditional methods of an axe or a handsaw. The geography of locales like Mahu—incredibly remote with limited options for income—contributes to illegal logging. It is completely cut off from the outside world for the 4-month rainy season due to bad roads. If they sell what they log at the rate Aung notes, the village can make at least $17,500 a month. A conservative estimate of annual village income from illegal logging—minus the rainy season—is about $140,000 annually. Htut is a native of Sagaing Division in his early 40s, and has been doing conservation work in Sagaing region since 2003. He is incredibly persistent when it comes to finding and reporting illegal logging. He once spent 10 days in the forest counting unmarked stumps in an area that had been logged and found that the company (whose name he didn’t disclose) had logged 572 extra trees. “It’s a very complicated procedure, I don’t understand the reason behind all this madness,” he said. “But I guess it’s the new government, and it comes with new rules.” The country held its first democratic election in decades in 2015 and brought human rights icon Daw Aung San Suu Kyi and her party, the National League for Democracy, to power. In June 2016 Burma’s Forestry Department amended its forestry laws to include a policy on chainsaw registration: Whoever uses a chainsaw without permission can be sued, face up to two years in prison, and/or a fine of up to $15. They also created a committee with police officers, local and regional forestry department officers, and township administrators to enforce chainsaw rules and regulations. That includes monthly reports from forestry departments in each township, district, division and state to headquarters in Naypyidaw. 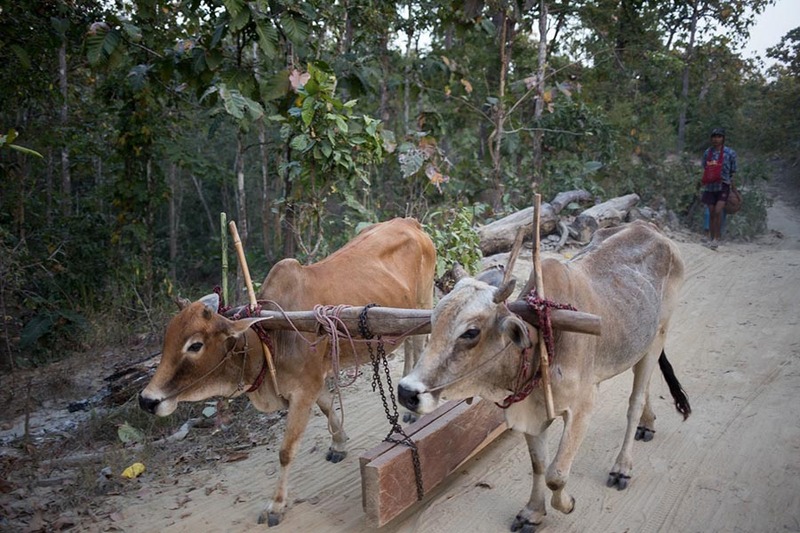 Combating the myriad aspects of illegal logging in Burma is already a huge job for authorities. Just as the national ban lifted in mid-April, officials announced that in the past year they seized 55,000 tons of illegal timber and 2,600 vehicles and pieces of machinery. Arrests of timber smugglers included 11 foreigners and 8,310 Burmese nationals. Burma is still in the early stages of regulating chainsaws, especially when it comes to import rules. Officer Phyo Zin Mon Naing is assistant director of Burma’s Forestry Department at Naypyidaw and oversees chainsaw registration. He said in an interview that he’s been working on issues regarding chainsaw registration since 2013, but prior to that there were simply no laws or regulations for chainsaws. In 2014, the government started to ask chainsaw users to register equipment, but the system was inefficient and difficult to enforce. 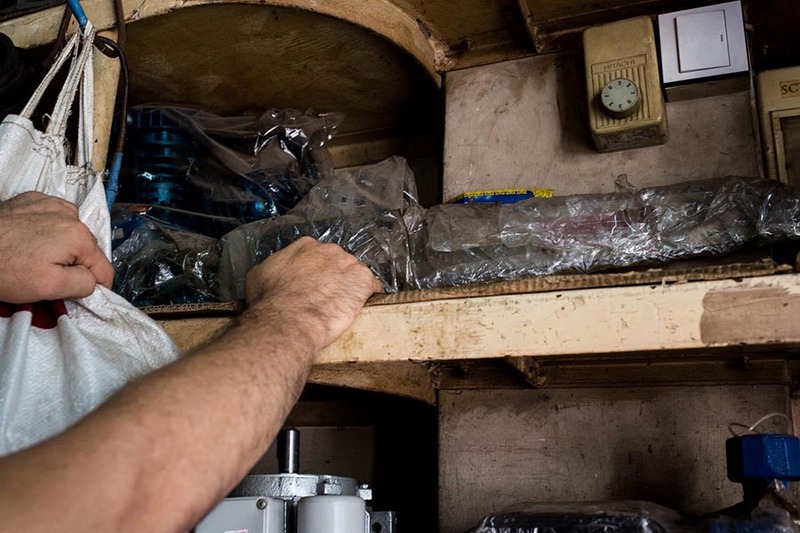 The complex procedure requires importers to submit an inquiry for a permit to import chainsaws and present their import license and company registration to the Ministry of Commerce. The Ministry of Commerce then submits it to the forestry department for a recommendation letter. In order to issue a recommendation letter, the forestry department has to first check the chainsaw type, country of origin, import method, the number of chainsaws in the current stock, a list of chainsaw distributors by the company and other detailed information. The importer isn’t technically allowed to sell their chainsaws if they don’t agree to monthly reports on their distribution and stock. “Now we have control over chainsaws in this country,” he said, adding that between 2014 to the end of 2016, they seized a total of 746 illegal chainsaws. Most of those come from individual owners and are handed over to the MTE. A major problem with monitoring illegal chainsaws is lack of control in insurgency areas, especially Kachin state in northern Burma. Kachin shares a long border with China and is largely controlled by the Kachin Independence Organization (KIO) and its armed group the Kachin Independent Army (KIA). They have an estimated 8,000 troops and are believed to be involved in illegal logging. “If you import a car from a foreign country you have to submit paperwork, so importing chainsaws should be treated the same way,” he said. “I have to pay $5 for my kids [per child] to go to school per month,” Kyi said. Though primary education is free in Burma, teachers often ask for extra money in rural areas to offset the cost of uniforms and books.